How far back should one go to find the origins of evil? For how long should one search one’s soul for the reasons one has been punished? Down how many strands of history – personal and political – should one investigate these questions? Andreas Pfluger explores quite a lot and goes a long way back and into a good many individual histories, but whether that is a good idea is another matter, and in one volume, too. When dealing with a monster Thomas Harris required at least four novels and several screenplays to describe Hannibal Lector, and used up several police officers in the hunt. he confluence of all those elements explains, why In The Dark is the size it is – it has to include Jenny’s history, the brothers’ history, and then the parallel accounts of the hunt told from the villains’ perspective and from that of the police control. When I say history, though, I mean the history of someone who is amnesiac (and there is not just one character with amnesia of some sort or another – there are several); and of course, the fake histories of others who have something in their past to hide who do not want reality to emerge. A lot of In The Dark is plain cops and robbers, with extra violence – there’s an escape attempt which ends in a river and still failure after some major falls, for instance; but occasionally there are some clever moments: taking a vehicle and expecting the destination to be in the satnav because the amnesiac driver would not trust themselves to remember where they are going is a smart move, and there is another good scene in a kitchen. The blind Jenny Aaron has been hurled to the floor and had cooking pots thrown at her by one of the brothers, which she has collected with a clatter under his supervision, only for the second brother to snarl on returning, ‘A cow in a byre, an earthworm in a dung-heap has more brains than you. You’ve just allowed her to take a look around’. She has used her acute hearing to echo-locate everything in the room, but has also learned of her opponent’s evaluation of her abilities. In a short Afterword Pfluger describes his research and names some powerful women in German society today who have overcome any handicap of blindness. There seems to be no reference to blindness in police officers, though. He avoids figures elsewhere, such as Sir John Fielding, the blind magistrate who founded the Bow Street Runners, who became the hero of a series of novels by Bruce Alexander. In the early twentieth century we had Max Carrados, created by Ernest Bramah as a rival to Sherlock Holmes, whose stories are still a good read. Conan Doyle, though, made a blind man the opponent of Sherlock Holmes: in ‘The Empty House’ Colonel Sebastian Moran’s air gun had been made by “Von Herder, the blind German mechanic”. A handicap is not a moral qualification or disqualification, despite Holm’s long lectures on the philosophy of good and evil. 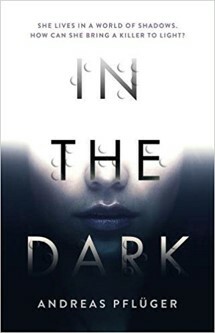 The last page of In The Dark suggests that Jenny Aaron will return; readers should explore other protagonists – heroes and villains – while they wait.